Order now for delivery on Tuesday, April 23. Total Carat Weight – 1 ct. tw. The ring you've selected is exceptional and deserves special attention. Please phone a diamond and jewelry expert and they will help you complete your perfect ring. If you don't see your ring size, please call 1-888-565-7641. We may still be able to help you. The selected ring size is temporarily unavailable. Please call 1-888-565-7641 for further assistance. 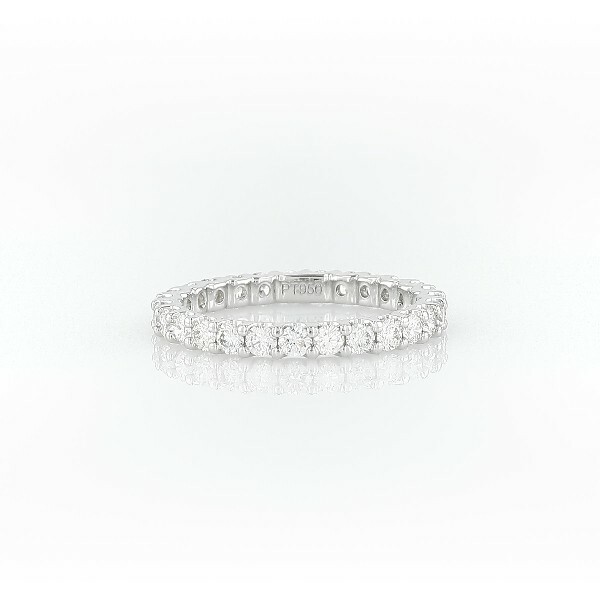 Brilliant in every way, this diamond eternity ring features round diamonds in a shared-prong and low-profile design in platinum. The selected ring size is temporarily unavailable. Please call 1-800-242-2728 for further assistance. If you don't see your ring size, please call 1-800-242-2728. We may still be able to help you. Women's rings typically range from size 3 to 9. The most commonly purchased women's ring sizes at Blue Nile range from size 5 to 7. Size 6 is the most popular ring size.